But before starting, I want to dedicate this post to all the doctors, nurses, scientists and patients that fight everyday against cancer, specially those from Hospital Miguel Servet de Zaragoza and Clínica Universidad de Navarra that treat my father, also to many other brilliant and devoted people that I have met from places like Vall d’Hebron Hospital, Quiron Dexeus or 12 de Octubre, and finally, to my new team at Agenus Pharmaceuticals. With next generation sequencing (NGS) we are able to sequence the full genome of a tumor or at least of the coding regions or exome. If we identify with the help of NGS data which tumor-specific genes express mutant peptides that are able to activate T cells, then we can design vaccines to boost the natural immune response to the tumor, this mutant peptides are also called neoantigens. There is a nice and recent Nature Review about neoantigens discovery, and also there are interesting articles with practical cases of neoantigens discovery and personalize treatments for cancer patients (e.g. Robbins et al., Pritchard et al.). pVAC-Seq v4.0: a pipeline for the identification of personalized Variant Antigens by Cancer Sequencing (pVAC-Seq) that integrates tumor mutation and expression data (DNA- and RNA-Seq) (original article). TSNAD: an integrated software for cancer somatic mutation and tumour-specific neoantigen detection (original article). 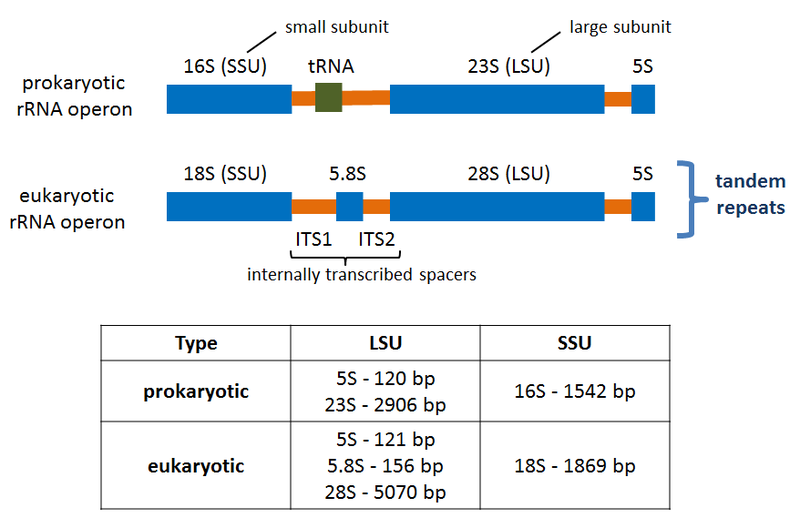 neoantigenR: an R package that identifies peptide epitope candidates (biorxir article). MuPeXI: mutant peptide extractor and informer, a tool for predicting neo-epitopes from tumor sequencing data (original article). INTEGRATE-neo: a pipeline for personalized gene fusion neoantigen discovery (original article). This protocol has been developed for didactic purposes and it is not formally validated neither intended for human diagnosis. Basically I propose here a somatic variant calling pipeline with some additional filtering of the variants at the end. 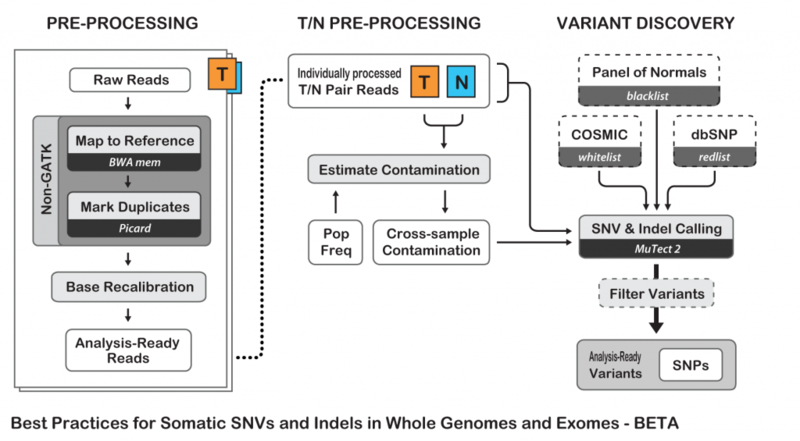 I tested the pipeline with whole exome sequencing (WES) Illumina paired-end reads from normal and tumor tissues. In the protocol I have chosen BWA-MEM as recommended in Cornish and Guda paper, original authors used Novoalign, but other aligners could be considered. In this aspect, aligners as Bowtie2 may be too sensitive and could report some extra false positive variants, but it’s just a personal opinion. Maybe this step could be skipped as there are not many redundant reads and it’s unlikely that they map in variant positions. MarkDuplicates from Picard tools was used, I would suggest in the future to try ‘MarkDuplicatesWithMateCigar’ from the same suite, but I have not enough experience to recommend it. This is just a formal requirement for the variant callers to work properly and distinguish between normal and tumor groups of reads. This step is already integrated in the Mutect2 somatic variant caller and could be redundant, but other variant callers do not integrate it so it is strictly recommended to avoid false calling of indels and surrounding SNPs. MuTect2 is integrated in the GATK suite, the basic operation of MuTect2 proceeds similarly to that of the popular HaplotypeCaller, with a few key differences, taking as input tumor and normal alignments and producing somatic variant calls only. Some strict filters are imposed to discover only true somatic variants: a minimum depth of 10 reads and a variant frequency of at least 10%. Additionally, variants must be in coding regions of genes (it is filtered in the last step). Normal and tumor or RNA-seq (more accurate) data will be used as input of AmpliHLA to retrieve the HLA alleles of the patient. NetMHCpan software will calculate the binding affinities of the designed peptides to HLA alleles, these predictions together with expression data will be used to estimate the potential immunogenicity of the peptides. Previous files (or equivalent ones) can be also downloaded from Google Cloud repository (not tested). To simplify I’ll consider that all the input files, including the genome and reads ones, are in the working directory and all the output files will be stored into the ‘output’ folder. All the comments are marked with ‘#’ to differentiate them from the commands. Programs will be installed in the standard ‘/opt’ folder in the Linux system and run with 30 threads when it is possible (number of parallel threads/processes should be adjusted depending of your server or computer). Analysis time will depend of the system and the number of parallel processes, in a small server with 30 threads it may take around 15-20 hours to be completed. Steps 8 and 10 are sill not fully automatized. MuTect2 may retrieve more than 10000 variants, but after filtering the number is reduced around 8-10 times. If we obtained around 1000 variants after previous filtering step, the annotation of only variants present in coding regions will reduce the number to few hundreds. # Analyzes WES, or RNA-seq if available, data and retrieves the HLA alleles of the patient that will be used in the last step to calculate the affinities of the peptides. 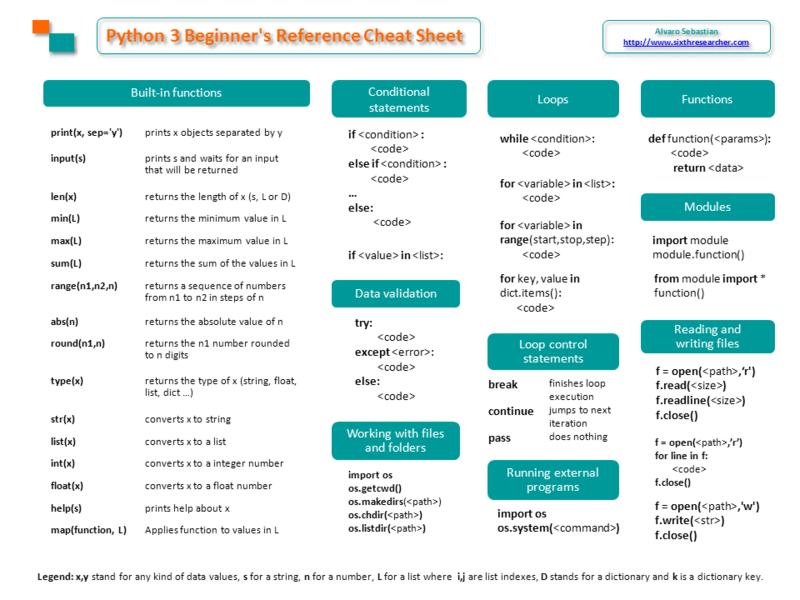 This post is a tribute to the work of my students in the subject “Basic Python Programming for Scientists“, as they did a great job in their final projects I want to show you here some examples that could be useful for many Python beginners. Remember that you can download the course slides from Didactic Materials sections. Today I’ll show you 2 projects that overcame all my expectations: Image Quiz from Błażej Szymański and Temperature converter by Michal Stachowiak.. In next days I’ll publish more incredible projects. fetcher.py: reads a file ‘list.txt’ containing the names of the birds to look for and use the Google API to retrieve the bird photo URLs that are stored as JSON format in ‘data.txt’. saver.py: retrieves the image files and saves them at ‘pictures’ folder using their URLs stored in ‘data.txt’. resizer.py: checks if the images are larger than 800px, if so they are resized. ‘Temperature converter’ by Michal Stachowiak, is a script that converts temperature values in different scales and saves the results in memory. He implemented temperature conversions between Kelvin, Celsius and Fahrenheit scales together with a database to store and modify the results. Here I’ll show a reduced version of the script that only converts from Celsius to Kelvin. I want to share with you the new section of Didactic Materials at the Sixth Researcher website. In this section I will include courses, presentations, workshops and other materials that I prepared and could be useful for other researchers. At the moment you can download 10 lessons with the fundamentals of Python 3 for biologists and other scientists that I imparted at UAM. Also is available a Metabarcoding workshop with the fundamentals of the technique and a practical example explaining the bioinformatics analysis of the data. The didactic materials in this new section will be licensed as Creative Commons Attribution-NonCommercial. Lesson 1. Running Python 3 in Windows. Lesson 2. Data structures: lists and dictionaries. Lesson 3. Data comparison and conditional statements. Lesson 4. User data input and ‘while’ loops. Lesson 5. ‘for’ loops and functions. Lesson 6. Built-in functions. Reading and writing files. Lesson 7. Python, Spyder, Jupyter and Anaconda. Lesson 8. Python scripts and modules. Lesson 9. NumPy, SciPy and Matplotlib. Last week I was teaching to my Polish students how to use the Python packages NumPy, SciPy and Matplotlib for scientific computing. Most of the examples were about numerical calculations, data visualization and generation of graphs and figures. If you are interested in the topic check the following links with nice tutorials and examples for NumPy, SciPy and Matplotlib. At the end of the lesson we also explored the capabilities of the scipy.ndimage module for image processing as shown in this nice tutorial. After all, images are pixel matrices that may be represented as NumPy arrays. After lesson my curiosity led me to OpenCV (Open Source Computer Vision Library), an open-source library for computer vision that includes several hundreds of algorithms. It is highly recommended to install the last OpenCV version, but you should compile the code yourself as explained here. To use OpenCV in Python, just install its wrapper with PIP installer: pip install opencv-python and import it in any script as: import cv2. In this way you will be able to use any algorithm from OpenCV as Python native but in the background they will be executed as C/C++ code that will make image processing must faster. Figure 1. 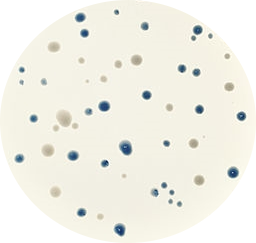 Original blue and white bacteria colonies in Petri dish. Let’s imagine that we are working at the lab trying to optimize a new cloning protocol. We have dozens of Petri dish with transformed bacteria and we want to check and quantify the transformation efficiency. Each Petri dish will contain blue and white bacteria colonies, white ones will be the bacteria that have inserted our vector disrupting the lacZ gene that generates the blue color. We want to take photos of the Petri dishes, transfer them to the computer and use a Python script to count automatically the number of blue and white colonies. Figure 2. Blue and white bacteria colonies are marked in red and green colors respectively as recognized by the Python script. It will print the number of colonies of each type (blue and white) and it will create an output image (Figure 2: ‘colonies01.out.png’) where blue colonies are marked in red color and white ones in green. Code works quite well but it is not perfect, it fails to recognize 2 small white colonies and also groups other 2 small colonies with 2 bigger ones of the same color. Finally, the script counts 30 blue and 17 white colonies. One of the most tricky parts of the code are the color boundaries to recognize blue and white spots. These thresholds have been manually adjusted (with Photoshop help) before the analysis and they could change with different camera illumination conditions. White colonies are more difficult to identify because their colors are grayish and similar colors are in the blue colonies edges and background. For that reason, image colors are inverted previously to white colonies analysis for an easier recognition. It’s not AI (Artificial Intelligence). I’d call it better ‘Human Intelligence’ because the recognition algorithm thresholds are manually trained. If you are interested in AI and image recognition I can suggest to read the recent article in Nature about skin cancer classification with deep neural networks. In the previous post I explained the fundamentals about the Amplicon Sequencing (AS) technique, today I will show some current and future applications in HLA-typing. Other field of use of AS is the genotyping of complex gene families. For example, the major histocompatibility complex (MHC). This gene family is known to be highly polymorphic (high allele variation) and to have multiple copies of an ancestor gene (paralogues). MHC genes of class I and II codify the cellular receptors that present antigens to immune cells. MHC in humans is also called human leukocyte antigen (HLA). HLA-typing has a key role in the compatibility upon any tissue transplantation and has been associated with more than 100 different diseases (primarily autoimmune diseases) and recently is associated to various drug positive and negative responses. HLA loci are so polymorphic that there are not 2 individuals in a non-endogamic population with the same set of alleles (except twins). As in personalized medicine and metagenomics/metabarcoding, there are 2 approaches for NGS HLA-typing: the first is to use the whole genomic, exomic or transcriptome data and the second is to amplify specific HLA loci regions by amplicon sequencing. Second approach is suitable for typing hundreds/thousands of individuals but requires tested primers for multiplex PCR of HLA regions. 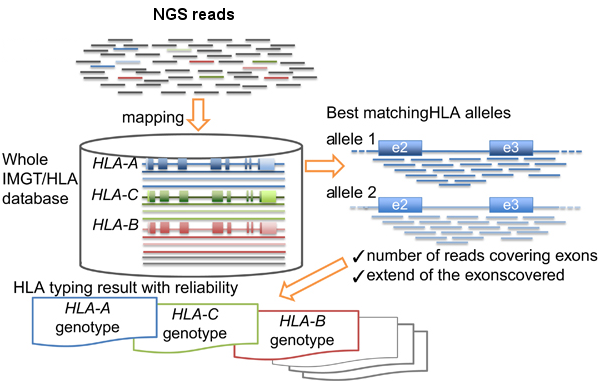 Map/align the reads against HLA allele reference sequences from the IMGT-HLA public database. Retrieve the genotypes from the references with longer and better mapping scores. Inoue et al. wrote a complete review about the topic in ‘The impact of next-generation sequencing technologies on HLA research‘. HLA-typing workflow. Modified from Inoue et al. Nowadays there are commercial kits that allow reliable, fast and economic HLA-typing: Illumina TruSight HLA v2, Omixon Holotype HLA, GenDx NGSgo or One Lambda NXType NGS. In the previous post I explained the fundamentals about the Amplicon Sequencing (AS) technique, today I will show some current and future applications in Metagenomics and Metabarcoding. Metagenomics (also referred to as ‘environmental’ or ‘community’ genomics) is the study of genetic material recovered directly from environmental samples. This discipline applies a suite of genomic technologies and bioinformatics tools to directly access the genetic content of entire communities of organisms. Usually we use the term metabarcoding when we apply the amplicon sequencing approach in metagenomics studies, also metagenomics term if preferred when we study full genomes, not only few gene regions. 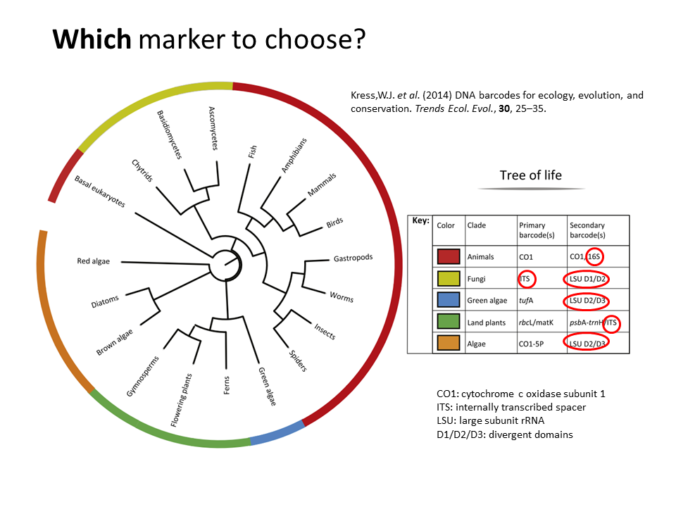 For metabarcoding, 16S rRNA gene is the most common universal DNA barcode (marker) used to identify with great accuracy species from across the Tree of Life, but other genes as: cytochrome c oxidase subunit 1 (CO1), rRNA (16S/18S/28S), plant specific ones (rbcL, matK, and trnH-psbA) and gene regions as: internal transcribed spacers (ITSs) (Kress et al. 2014; Joly et al. 2014). The previous genes have mutation rates fast enough to discriminate close species and at the same time they are stable enough to identify individuals of the same specie. The pioneer metabarcoding study of Sogin et al. 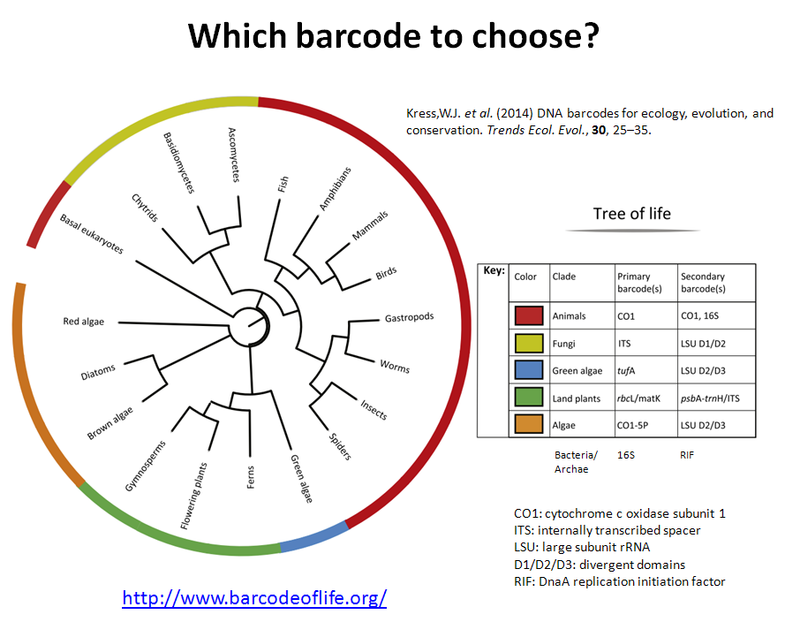 2006 to decipher the microbial diversity in the deep sea used as barcode the V6 hypervariable region of the rRNA gene. Sogin et al. sequenced around 118,000 PCR amplicons from environmental DNA preparations and unveiled thousand of new species not known before. Observe that in metabarcoding we cannot use DNA tags to pick out single individuals, but to identify different samples (of water, soil, air…). Amplicon sequencing (AS) technique consists in sequencing the products from multiple PCRs (amplicons). Where a single amplicon is the set of DNA sequences obtained in each individual PCR. The solution to the previous limitation was bacterial cloning and further isolation, amplification and sequencing of individual clones. Nevertheless, bacterial cloning is a time-consuming approach that is only feasible with few dozens of sequences. Fortunately, high-throughput sequencing techniques (HTS) also called next-generation sequencing (NGS) are able to sequence millions of sequences with individual resolution. And the combination of amplicon sequencing with NGS allows us to genotype hundreds/thousands of samples in a single experiment. The only requirement to carry out such kind of experiment is to include different DNA tags to identify the individuals/samples in the experiment. A DNA tag is a short and unique sequence of nucleotides (ex. ACGGTA) that is attached to the 5′ end of any PCR primer or ligated after individual PCR. Each tag should be different for each sample/individual to analyze to be able to classify the sequences or reads from each individual PCR (amplicon) (Binladen et al. 2007; Meyer et al. 2007). Again, NGS has other intrinsic problems: sequenced fragments are shorter than in Sanger and sequencing errors are more frequent. Random sequencing errors can be corrected by increasing the depth/coverage: reading more times the same sequence. And longer sequences can be split in shorter fragments and assembled together later by computer. Experimental design of the primer sequences to amplify the desired gene regions (markers) and of the DNA tags to use to identify samples or individuals. PCR amplification of the markers, usually an individual PCR per sample. NGS sequencing of the amplification products. The most commonly used techniques are: Illumina, Ion Torrent and 454, also Pac Bio is increasing in importance as its error rate decreases. Bioinformatic analysis of the sequencing data. The analysis should consists in: classification of reads into amplicons, sequencing error correction, filtering of spurious and contaminant reads, and final displaying of results in a human readable way, ex. an Excel sheet. 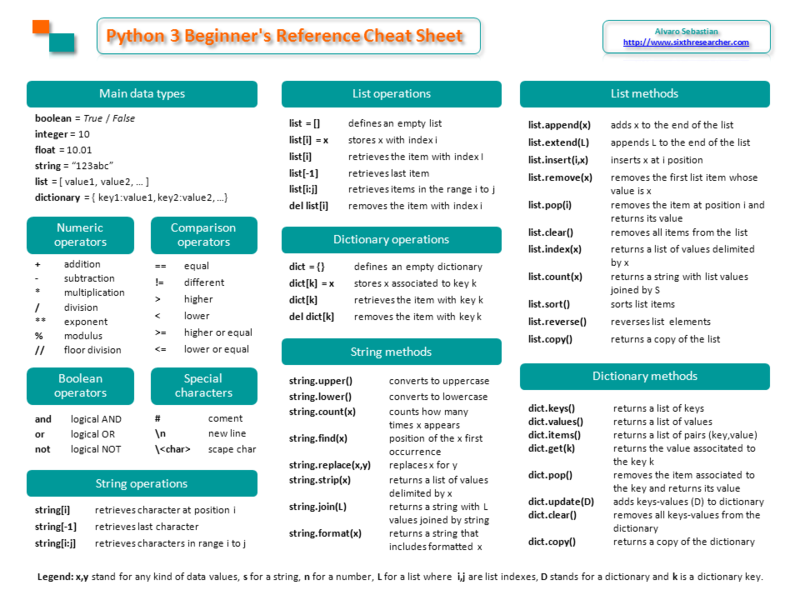 Today I want to share a Python 3 reference/cheat sheet that I prepared for my students, I tried to collect in two DIN-A4 sides the most popular Python 3 data types, operators, methods, functions and other useful staff that people learning Python need at the first months and even later. You can download the updated version of the reference sheet in PDF format from the Didactic Materials section. BLAST changed some time ago for better and faster to BLAST+ version, but along the way small differences were introduced that may confound more than one. Old BLAST was run with the command ‘blastall‘. In this way, a protein alignment should be called as ‘blastall -p blastp‘ and the same for nucleotides should be ‘blastall -p blastn‘, and if we want to use MEGABLAST then it exists the different command ‘megablast‘. 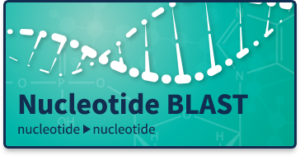 Nevertheless, in the ‘new’ BLAST+ version, the alignments of proteins and nucleotides were splitted in two different commands: ‘blastp‘ and ‘blastn‘ (see manual). Till here, everything looks natural and logic, but not everyone knows that THE DEFAULT OPTION IN THE NEW BLASTN COMMAND IS MEGABLAST. But not everyone is interested in increasing the alignment speed, because many of us that still use Blastn is because we appreciate its great sensitivity to detect short local alignments. Nowadays Blast can align thousands of sequences in a reasonable time of minutes or even seconds. To increase the alignment speed in alignments with millions of sequences involved there are other better alternatives as Bowtie2. If not, we will execute MEGABLAST and we can lose a great sensitivity and risk to not to find the expected alignments. It is a big difference, megablast does not find any significant similarity, whereas blastn outputs a high similarity alignment with an E-value of 1.5E-56!!!! You can read my original post in Spanish at ‘Bioinfoperl’ blog. I want to announce that on 19th October I’ll teach the workshop titled “Introduction to Bioinformatics applied to Metagenomics and Community Ecology” during the conference Community Ecology for the 21st Century (Évora, Portugal). In this workshop I’ll introduce the new tool called AmpliTAXO that allows an online, easy and automated analysis of NGS data from ribosomal RNA and other genetic markers used in metagenomics. If you are interested, you can contact here with the conference organizers to join the workshop or the full conference, there are still available places in the workshop. The workshop will consist in two modules, in the first, will be exposed the metagenomics fundamentals, challenges, the technical advances of the high-throughput sequencing techniques and the analysis pipeline of the most used tools (UPARSE, QIIME, MOTHUR). The second part will be practical and we will perform an analysis of real metagenomic data from NGS experiments.